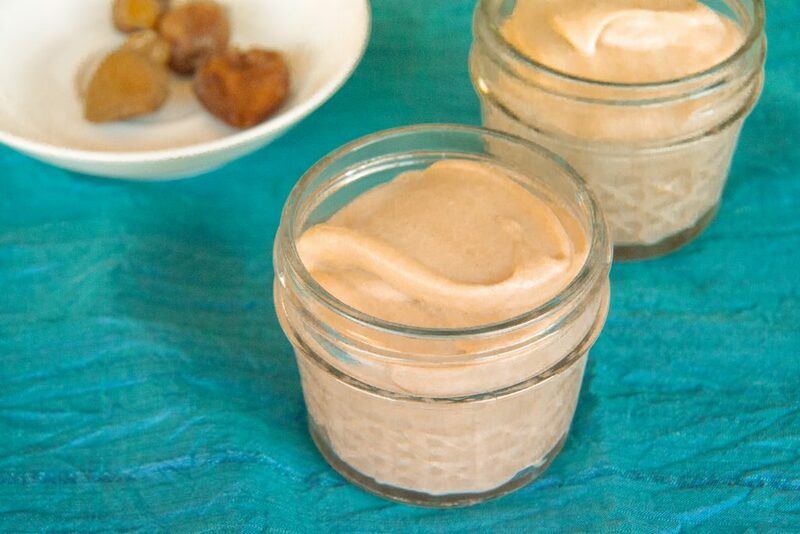 Chestnuts are wonderful, versatile things, as useful in sweet desserts (like this irresistible chestnut mousse) as they are in savory dishes. Their high starch content makes them softer and creamier than most nuts. (Fun fact: chestnuts contain twice as much starch as potatoes!) In places where chestnuts are a native crop, they’re often used as vegetables rather than nuts. Some of the most delicious chestnuts I’ve eaten were in Greece; they were roasted with onions in a light tomato sauce. Chestnuts are the only nut that contains vitamin C, and unlike most nuts, they contain very little fat, making them a low calorie choice in the foraged nut department. Not that this recipe is low cal. I make no apologies for the cream, egg yolks, rum, and sugar. This is a wonderful dessert for a special occasion, and probably my favorite way to use chestnuts. Pour 1 tablespoon cold water in a small cup and sprinkle the gelatin on top, then set aside. In a heavy saucepan, combine the chestnuts, rum, milk, salt, and vanilla, then bring to a simmer. Cook until the chestnuts are breaking apart and the volume of liquid has reduced by about half. Whisk frequently to prevent the milk from scorching. When the volume is reduced (approximately 15-20 minutes), add the gelatin, whisking to dissolve. Once the chestnut cream has cooled, beat the heavy cream to soft peaks in a separate bowl. Set that aside. With an electric mixer, beat the egg yolks and sugar until they are thick, about 4-6 minutes. Add the chestnut cream and continue to beat until well combined. By hand, gently fold the whipped cream into the chestnut cream, then pour into glasses or ramekins. This can be served right away, or refrigerated for a firmer mousse. The texture of this dessert is silky and light, and the flavor is subtle yet distinctive. Try topping with some chopped candied nuts or a spoonful of homemade preserves. Ellen, Do you use American Chestnuts (not sure there are many left) or Chinese Chestnuts? Perhaps their flavor is very similar. Hi Becky! My guess is that the tree I forage from is a Chinese chestnut, based on its age, size, and shape. You’re right about there not being lots of American chestnuts around, although all true chestnuts (genus Castanea) hybridize naturally, so it’s possible you could come across a hybrid with some American chestnut DNA in it, in the wild.